Canada Revenue Agency (CRA) is the government agency responsible for administering the Income Tax Act (ITA), the law that regulates charities. 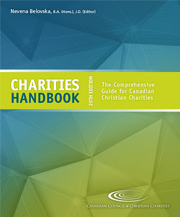 Charities are required to comply with the ITA and be ready to respond to a CRA audit at any time. CRA auditors will be looking for compliance on various issues, such as income reporting, source deductions, GST rebates and reporting, proper receipting, and resource spending. Outcomes of audits can include education letters, compliance agreements, assessments, or even a letter of intent to revoke the charity’s status. To retain their registered status, charities either need to comply with these letters or exercise their right to file objections or appeals. 18: What is “due care” in considering questions charities face?